Quite a few tools related to intrusion detection, malware analysis and compromise detection tools utilise YARA rules during the scanning phase. LOKI and FastIR being two recent examples. 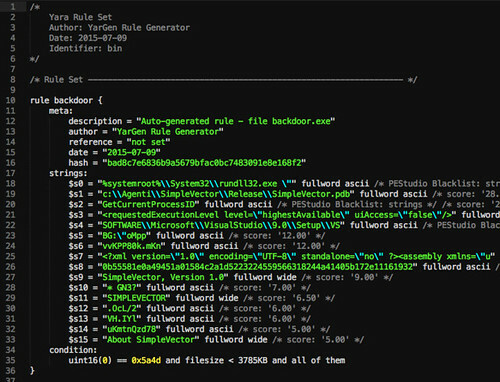 The above rule is telling YARA that any file containing one of the three strings must be reported as silent_banker. This is just a simple example, more complex and powerful rules can be created by using wild-cards, case-insensitive strings, regular expressions, special operators and many other features that you’ll find explained in YARA’s documentation.